The North Sails full radial M-3D is an all purpose mainsail that is built to complement both Selden and Super Spars range of mast. Manufactured from RSQ 4.55 sail cloth. The North Sails full radial M-3 is has the same flying shape as the M-3 manufactured from North Sails exclusive range of Xi laminate sail cloth. This is purposely designed and built for full radial construction to help hold the flying shape in high load areas. The North Sails bi radial DJ-4R genoa is designed to compliment the M-3 mainsail range. Manufactured from Contender RSQ 4.55 sail cloth. 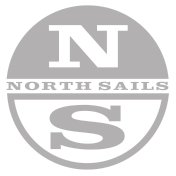 The North Sails bi radial GS-2 clews help to the sail to go through the wind range better, this makes it a great all rounder. Manufactured from Dynakote 75.